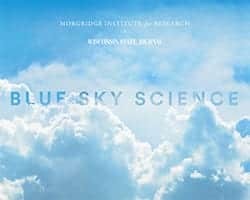 News & Stories > Blue Sky Science > How do the sun and rain make rainbows? Rainbows are really cool because they’re a blend between art and science. It required a number of scientists to actually explain how they form, including Isaac Newton. Light from the sun is made of multiple colors, not only the colors we can see, but colors that we can’t see. And Newton demonstrated this by passing a ray of light through a crystal. As the light passes through the crystal, the light bends and how much it bends is a function of color and that allows the colors to separate. The other thing we need to know is calm water can act like a mirror. Now let’s put all this together and talk about how the rainbow forms. A ray of light hits an individual raindrop. As it goes in, it bends. That bending is a function of the color. If it goes in at the right angle, it hits the back of the drop and the back of the drop acts like a mirror and reflects that ray of light back towards the front. It leaves the drop, into the air, and bends again. So those colors get separated. And eventually it will reach our eye. But only one color will reach our eye from every single drop. So the rainbow effect when you see the entire bow or even part of the bow, that’s not coming from one drop. That’s coming from millions of drops. Every single part of that rainbow is being developed by one particular drop. So they’re artistically beautiful and yet scientifically complex. Why do the northern and southern lights only appear near the poles?